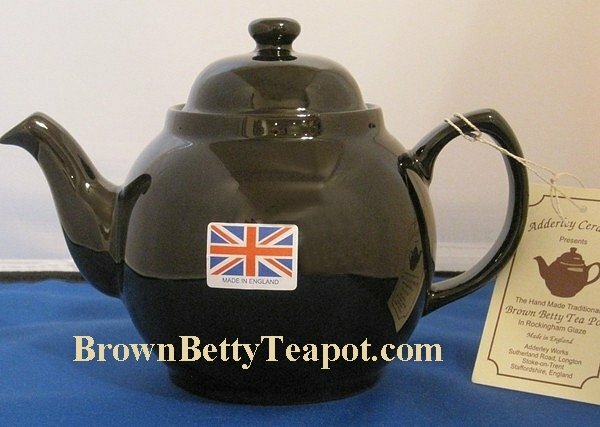 We are delighted to offer you the new Brown Betty produced in England by Adderley Pottery. These Betty Teapots hold the heat well and will brew a marvelous pot of tea for you. They come in four sizes and when we measure their capacity we show what is the useable amount of each teapot allowing for tea or teabags. Another truism is 'You get what you pay for' and it is quite true for these new Bettys. 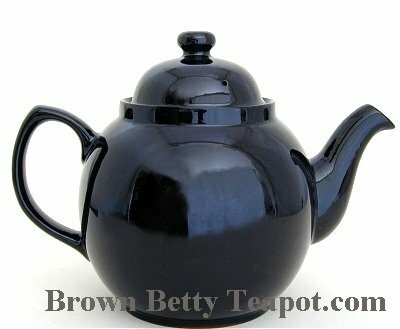 They are a bit more expensive than other Betty Teapots but we believe these teapots will give you every satisfaction and guarantee them for a period of a year from your date of purchase against crazing. Please scroll down to select your size. 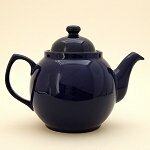 If you are giving a brown betty as a gift do consider adding some tea and biscuits offered at the bottom of this page. A scaled down version this two cup Brown Betty may be what you are looking for. Although rated as an 8 cup it holds approximately 60 ounces and will make a useable 7 eight ounce cups of tea. Cobalt Blue brown betty teapot. When preparing your tea you should figure this teapot will make a useable five 8 ounce cups of tea as you will not be filling the teapot to its 48 ounce capacity as you will be leaving room for the teabags.